Get ad-free, quality personal finance articles on topics you care about. We never sell e-mails or anything ridiculous like that. New Year, new savings goals! Do you remember over the glass of champagne toasting to your loved ones on New Years Eve and telling yourself that 2019 was really the year you were going to get your savings in order? Now is the time to make a plan that you can stick with. 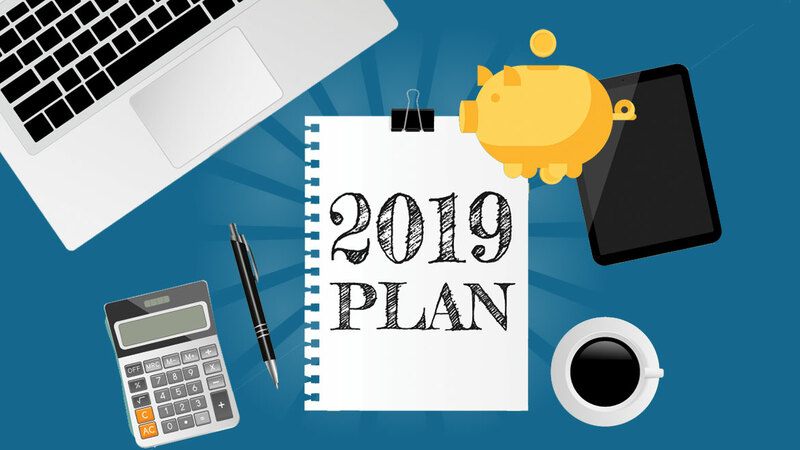 Use our tips to stay on track and reach your 2019 savings goals. Start small. Set a target amount for 2019 that can be easily reachable. Maybe it is only $1,000 for the whole year of 2019. Your target should be something easily reachable. Once you have a figure in mind, it is easy to measure your success! Be kind to yourself and make adjustments where necessary but keep trying to reach your target. Download a budgeting app. Our favorite is Banktivity. The budgeting app you choose should show all transactions that are made on your accounts either automatically or manually entered by you. Once you have all your transactions, you can categorize them so you can see at a quick glance exactly where every single dollar is going. I find it easy to see what areas need to be tightened up when they are all displayed together and totaled for the month. When I started doing this, I was shocked at our food bill. I was grossly underestimating how much my family spent on groceries. By viewing your accounts this way, you can also see if there is any money left over for the month that should be moved to your savings account. Set a plan for your savings from the beginning. You spend all year tightening your budget and following our tips, but now what are you going to do with the extra money? Maybe it is having 3 months expenses in an emergency fund? Maybe it is for a down payment for a house? Maybe it is to take the whole family on your dream vacation? Whatever your goal is, set the amount and chip away at meeting it. I find it more fun and realistic if I know exactly what I am saving for and how much. Have a support system. Everything is more fun with a buddy! Your savings buddy can be your spouse, family member, friend or anyone. Having someone to cheer you on can help you stay on track. Imagine you are running a marathon and someone is there with a sign screaming for you in the 20th mile. By having a savings buddy that you can discuss and share your victories with, it keeps your goal in the forefront of your mind and you are more likely to continuing succeeding. In my household, we like to make it competitive. I bring home my grocery store receipts and show my husband what percentage I saved by using coupons, buying things on sale or through the store’s app. He will then try to do the same thing the next time he goes to the store and try to beat me! We hope that you can use some of these tips to reach your savings goals. We love to hear from you and share with each other. What are you doing to make sure your savings are on track for 2019? This is terrific advice. As a single mom, I squirreled away $20 a week in cash in an envelope. My “freak out” fund. Meaning…I can use for extravagances, cautiously or not. Gifts to others. Concerts. Taking my son to see a Tiger extravaganza at a wild life park. A new sweater. The energy of seeing the greenbacks pile up was magnetic. Sometimes I could sneak in an extra $5. In one year….52 x 20= $1010 cash. It just surprises and delights you. I would gloat over the money in the stash, and enjoy the idea that I COULD buy …..a trinket, a book, a new whatever……or I could get the book at the library, and enjoy the treasury of Possibilities in front of me. This habit eventually led to a computer…Quicken…then the real ADVANCE…Banktivity! I have financed grad school, setting up a tiny corporation, buying a home, and rental property. This led to a tiny Charles Schwab imaginary stock fund, which became my money garden. Eventually, real stock purchases, retirement funds, trips to Europe, and my home in Hawai’i. Money is a tool for creating MORE….money, tools, education, gifts, and healthy habits. I love your story! You could become a coach and/or at least write a book for those of us who did not do finance in school or in life. I find this inspiring, especially as I never feel that there is ever any extra. I’m going to try the path you followed and see if I can get it going for myself. Thanks! Please let us know how your are doing with your savings plan and feel free to share what things work for you. This is great advice and examples. Thank you so much for sharing! We never sell emails or anything ridiculous like that.